I quite liked that idea, as it would let me keep a USB drive emulator in the Osborne case where it was easily accessible, but without needing to make any permanent changes to the Osborne. I’m sometimes willing to make changes to retro equipment, but only to very common machines. For something as rare as the Osborne any modifications had to be easily reversible. Ideally they shouldn’t change the aesthetic too much either. I think this solution might fit the bill. 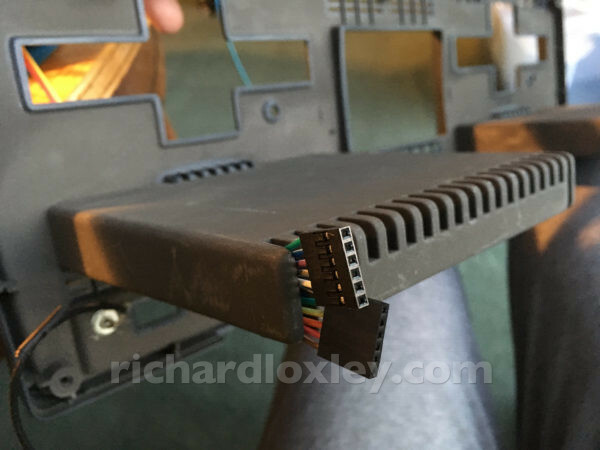 The only problem was how to route cables to the floppy. 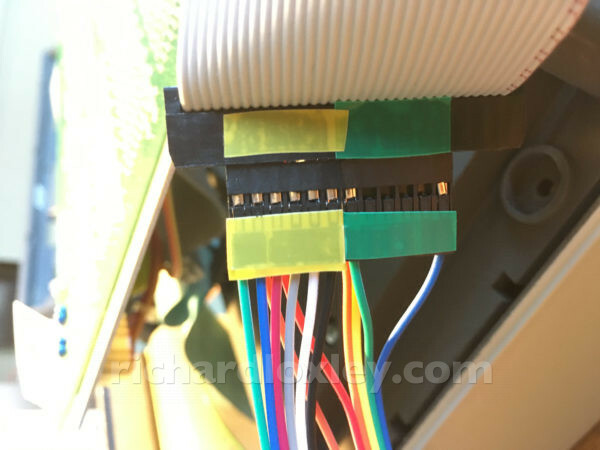 A typical 34 pin floppy cable is very wide. 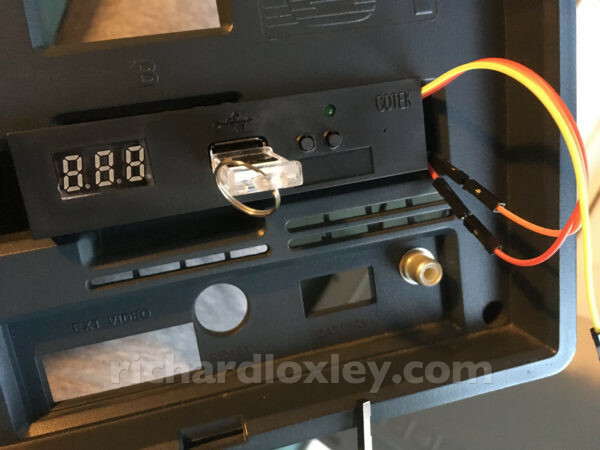 I measured one, and I could just get one through the hole of the “Ext Video” port (where it says “DO NOT REMOVE WHILE POWER IS ON” in the above photo). 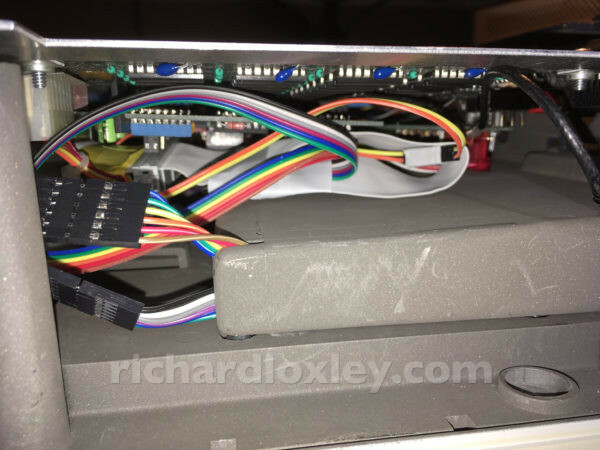 But then a light grey cable would snake its way up the outside of the machine. 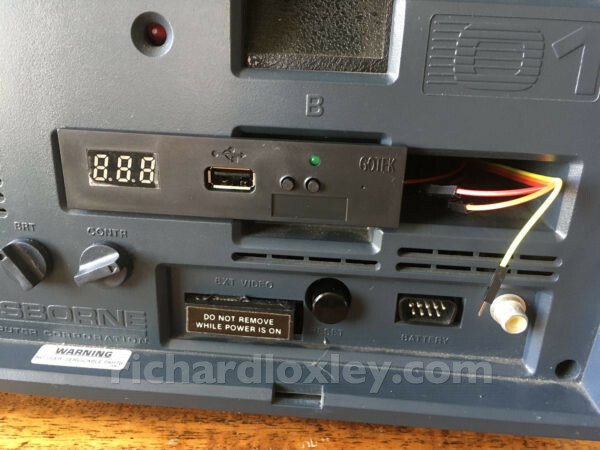 I also eyed-up the ventilation slot just beneath the Gotek, as it’s the perfect width, and the cable would go up nicely through the indents designed to allow your fingers to grip the stored floppy disks. But that would mean permanently removing the vertical bits of that grill, which I don’t want to do. On the left side of the machine I could get a cable out of the IEEE 488 port, but then the cable would go diagonally up to the left storage pocket. 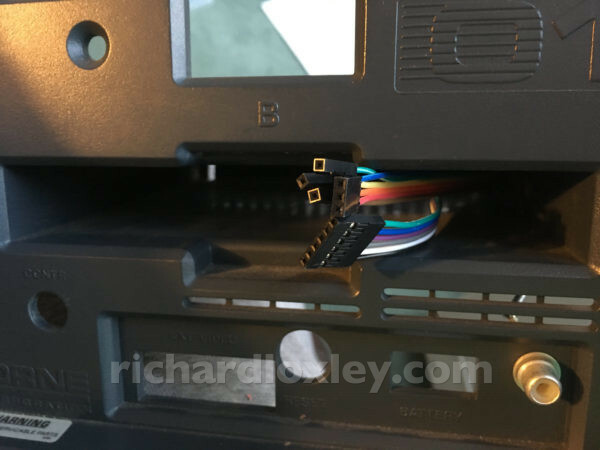 The RS232 port is more central, but it would be a tight fit to get the floppy cable alongside the socket, and might stop me using the RS232 (which I will probably still want to use). 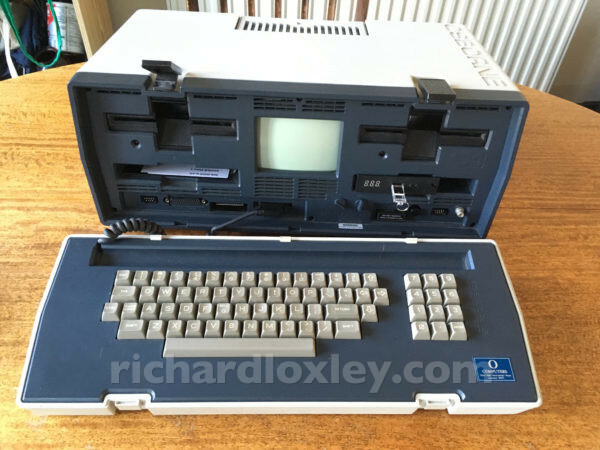 Either way, I don’t really want to use the left pocket, as it’s very hard to fold up the keyboard unless you tuck the keyboard cable in that slot! So let’s work on the idea of putting the Gotek in the right pocket, and have it emulate a B drive. 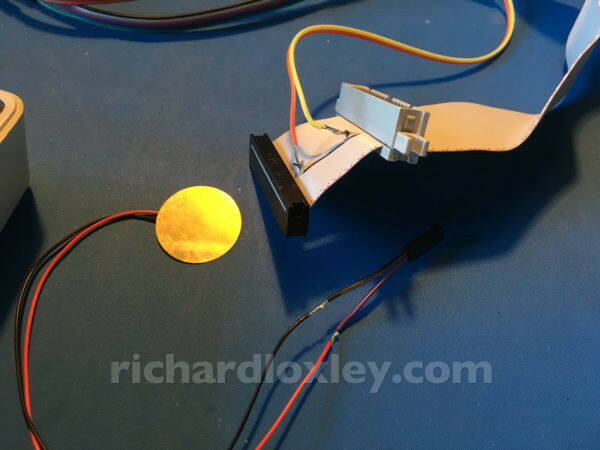 Ideally we’ll have a way of switching between the physical B drive and the emulated B drive. 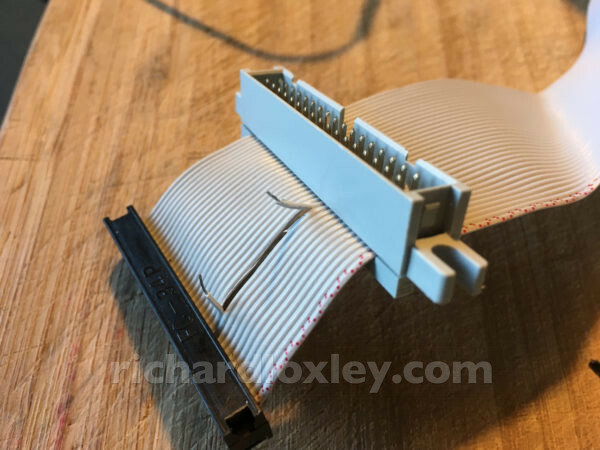 They wouldn’t fit a floppy connector. 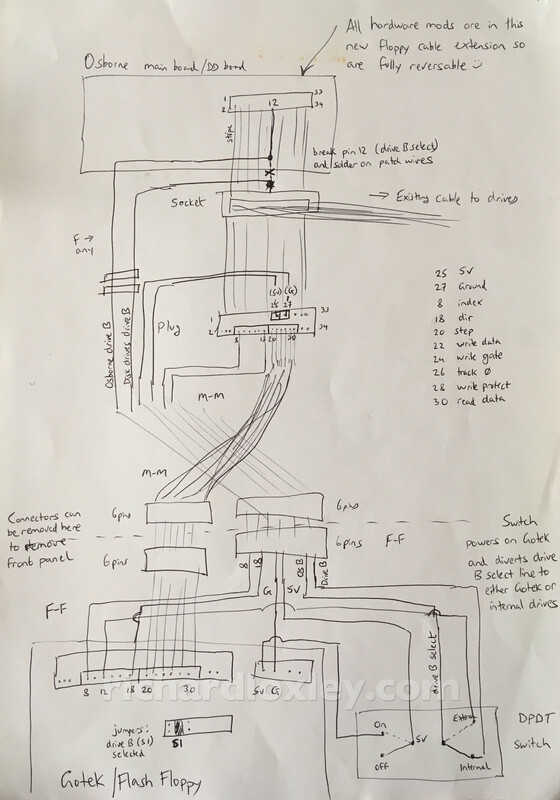 A floppy cable would probably fit through if I doubled it up – but then I’d have to install plugs either end after feeding it through, making the cable fairly permanent (without cutting it). Not ideal. That’s just 11 pins :-) If I want to switch between the physical and emulated drives, I’ll need an extra line connected to a switch to send the drive select signal back to the physical drive. That’s a nice round dozen – or two 6 pin cables that will happily fit through the slots! 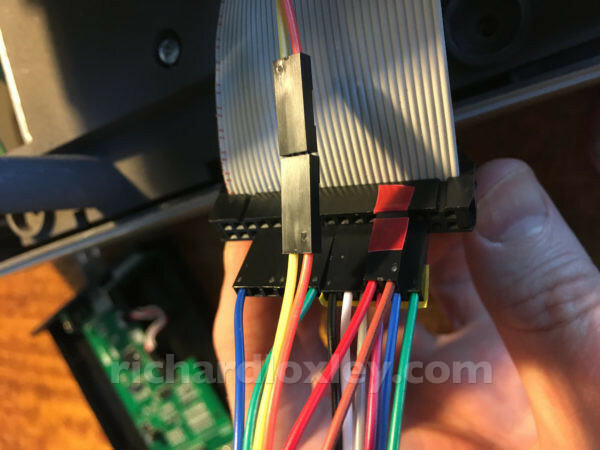 The idea is I have a 34 pin floppy extension cable inside the machine, to intercept the existing floppy cable without cutting it. Then I use Dupont ribbon cables (from a floppy plug) to take the signals I need to the front of the machine. Then further Dupont ribbon cables take the signals into the floppy storage pocket to the Gotek drive. Everything is removable, and in modular sections for easy disassembly of the machine in the future. 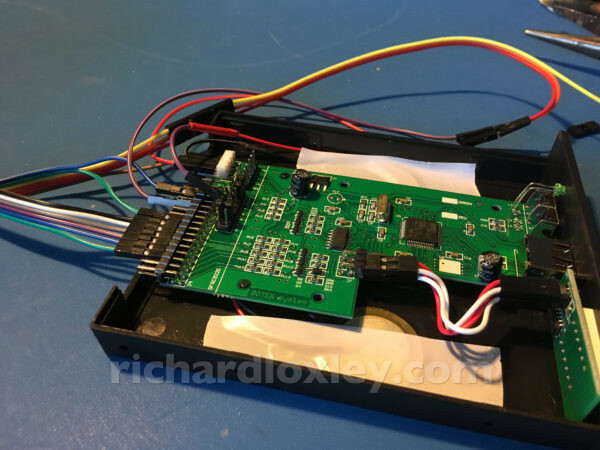 The DPDT switch will allow me to switch the Gotek on and off, and when it is on the drive select signal will be routed to the Gotek, and when off it will be directed to the physical B drive. 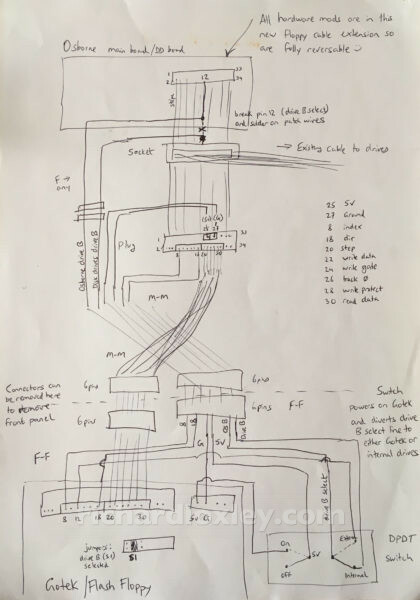 I take the other signals from a socket on the extension cable. Connectors colour-coded for future convenience! This is looking like it’s going to work! Now to wait for the next components to arrive.